I’ll be honest with you. I don’t actually think geomancy is nearly as earthy as people make it out to be. Yes, the word “geomancy” comes from Greek γεωμαντεια, literally “earth-seeing”. Yes, St. Isidore of Seville and Hugh of St. Victor, two philologists and academics of the medieval era, list geomancy as a form of divination alongside other elemental forms of divination (although St. Isidore lived and wrote about geomancy several centuries before we have records of it ever being practiced). However, I think this is glossing over something very important. If you look at the history of the word geomancy, the Greek word was a calque (literal word-for-word translation) from the Arabic term for it, `ilm al-raml, which literally means “science of the sand”. This is in reference to the way the first geomancers practiced their art, by drawing out the figures and dots and lines in sand or loose, fine soil as would have been done by shepherds and holy men in the desert climates of the Sahara. Thus, sand being the “earth” of the Arabs, I suppose it’s reasonable to translate `ilm alm-raml literally as “earth-seeing”. 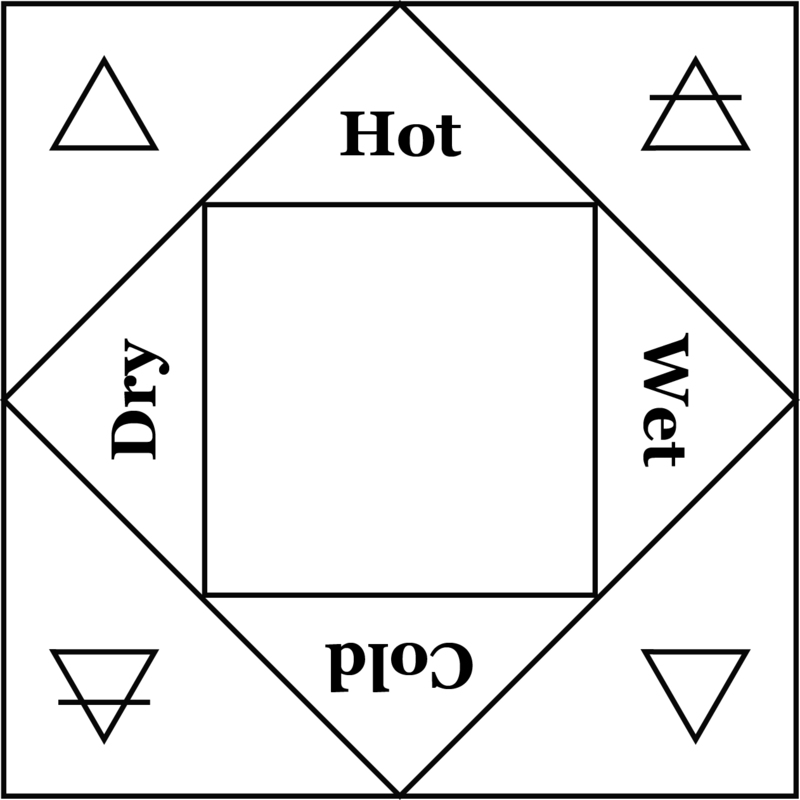 Then again, maybe “geomancy” isn’t the best name for this art of divination I practice, either. In its deepest, oldest, and most tried-and-true sense, geomancy should be just that: earth-seeing, scrying using dirt or rocks or crystal formations in and upon the Earth itself, just as pyromancy is scrying flames or just as hydromancy is scrying the patterns and images that appear in bodies of water. To use the word “geomancy” implies a strong connection using the natural resources of the Earth that express the element of Earth, and, well…that’s simply not the case with the art called “geomancy”. To put it simply, geomancy is not based on Earth, but based on the Earth; it’s not about γη the element, but Γη the place we live. There is, quite literally, a world of difference between the two. Consider, if you will, a bit of Qabbalah. The sephirah associated with the Earth is Malkuth, sephirah #10 at the bottom of the Tree of Life. This sephirah is seen as the distillation and combination, the entire purpose and the entire root of the Tree of Life. However, while each of the other sephirah are presented as just one color (e.g. red for Geburah, yellow for Tiphareth, green for Netzach), Malkuth is unusual in that it’s presented as four colors all at once: citrine, olive, russet, and black. This is because Malkuth isn’t a single atomic force, but a combination of the four elements that are Air, Water, Fire, and Earth. Older European Hermetic depictions of the cosmos as a series of nested spheres often show the Earth as within four spheres of the elements Earth, Water, Air, and Fire all nested within the sphere of the Moon. Thus, the Earth is the combination of the four elements Fire, Air, Water, and Earth that together make up our world; the Earth is not synonymous with the element Earth. Similarly, the art called geomancy uses 16 figures that are themselves amalgamations of the four elements, and manipulates them using binary algorithms to figure out what’s going on in the world we live in. Geomancy doesn’t just deal with the element of Earth, but it deals with those of Fire, Air, and Water equally as much to figure out what’s going on in the world we live in. Geomancy isn’t about divination with the element of Earth; geomancy is about divination to understand the Earth and what’s going on in this sphere we call “the World”. Perhaps another, more appropriate word for this art might be κοσμομαντεια, cosmomancy or “cosmos-seeing”. It’s more inclusive than just using the element of Earth, since we geomancers actually use all four elements in all their combinations, just as the world, or the κοσμος, we live in expresses all the elements in all their combinations. Alternatively, seeing how we use the four elements in divination, we might also call it στοιχειομαντεια, stoicheiomancy or “element-seeing”, perhaps which can be translated “theoretical alchemical divination”, which isn’t a bad way to summarize the art of geomancy generally. However, I doubt I’ll be able to shift to using these alternate terms anytime soon, or encourage others to do the same; the word “geomancy” is simply too entrenched into the art over its millennium-long history, and I’m a little fond of how it rolls off the tongue. Still, I think it’d do the geomantic community well to take another look at the term “geomancy” and remember that it’s not the element of Earth that we focus on, but the world we call the Earth that geomancy relies upon. Geomancy can be considered “terrestrial astrology”, as Stephen Skinner famously called it; while it does injustice towards the arts of geomancy and astrology alike, it makes sense from an outsider’s point of view. Astrology is the understanding of the heavens using heavenly bodies and how they affect us; geomancy is the understanding of the World using worldly elements and how they affect us. Consider this another way, too: when we read the geomantic chart, we start with the Judge and work our way up. We literally begin at the bottom and look upward. That’s basically the perspective of everything from the Earth’s point of view; it looks upward from beneath everything, seeing everything from below. This ties in elegantly with late Renaissance theories of how geomancy “works”; while most geomancers agreed that it was an act of the soul within humans that allowed it to reach out and contact the divine for guidance, it was also played in part by the anima Mundi, or the soul of the world, that gave us the answers. In contacting the Earth, we learn pretty much everything that happens, has happened, and will happen, and get a pretty down-to-earth (boo) and objective answer. So, I think I’ll disagree with how the estimable John Michael Greer labeled the art when he titled his first book on geomancy “Earth Divination: Earth Magic”. Geomancy is far from being divination-by-earth, but should be seen rather as divination-of-the-Earth. The distinction in nuance here is pretty big, and I think it’d pay off well for us geomancers to reconsider how our art came to be and the forces we’re calling on. If we’re just calling on the powers and spirits of the element of Earth to help us in geomantic divination and works, then we’re effectively forgetting the other three-quarters of the art that involve the powers and spirits of Fire, Air, and Water. I think a healthy spiritual approach to this art should remember that fact, and model itself accordingly. Water is a fecund essence, the support of earth, as a nutritive essence. Delightfully short! While definition II.2 described air and II.3 described earth, II.4 describes water, and unlike the others, it’s pretty straightforward. Water is “fecund”, so it helps nurture and produce; water is the essence of fertility. Without water, nothing can grow; although earth is the nurse of the living, it’s water that helps them thrive, it’s water that helps nourish and provide nutrition. Dry earth alone can do nothing, but with water, earth can be made into clay or loam, and be made to grow. Water is that which provides and builds upon the earth. The middle part of this definition, though, says that water is “the support of earth”. We’ve encountered this type of phrase before in II.3, where “earth is the support of the world”. In II.3, we understood that to mean that the cosmos is made material and sensible because of the quality of earth, that all things with any mass or matter in them owe it to their component of the earthy element. Thus, just as the soul “keeps up the figure while being within the body” (I.3) and so is the support of the body, earth is the support of the world. In II.4, however, we find that earth itself is supported by water. Does that mean that earth owes its earthiness to water? In a sense, yes, though it’s a little hard to discern. Thereon out of the Light . . . a Holy Word (Logos) descended on that Nature. And upwards to the height from the Moist Nature leaped forth pure Fire; light was it, swift and active too. Here, while fire flies to the top (upper heavens) and air follows it (the conjunction between the heavens and the earth), earth and water are mingled together as a single mass or body, just as the cosmos itself is composed of many parts but is still one whole body. In this sense, we start to find yet another microcosm: just as Man as a “small world” (I.4) reflects the cosmos and God because of “soul and breath” in addition to his body, the Earth (not just the element, but the planet) is a microcosm in itself of the macrocosm. However, the combination of earth and water in the beginning was at first chaotic: as in Genesis 1:2, “and the earth was without form, and void; and darkness was upon the face of the deep, and the Spirit of God moved upon the face of the waters.” However, as in the Poemander, “by reason of the Logos”, they were moved and made into form, just as God in Genesis spoke and gave form to the heaven and the earth. Thus, while earth is the support of the world, water is the support of earth, and since water and earth both come from the cosmos, water is also the support of the world. For anything in the cosmos to grow or nourish, water must be present, just as earth must be present for anything to be sensible or material in the cosmos. Water is the essence of growth and production, just as earth is the essence of matter and sensibility. However, earth can also be the foundation for any measure of increase or decrease, the growth and destruction of anything in the cosmos. Starting with earth, if one adds water, the matter inceases; if one removes water, the matter decreases. This is similar to dehydration of foods; anything plump and juicy when dried will shrivel and desiccate. Continue this long enough by removing enough water, and only earth will remain. Add water again, however, and you’ll make the earth fertile again to grow new things from it. Earth and water are necessary for anything in the cosmos to live; it’s not enough to merely exist as an inanimate object (and, indeed, no such thing truly exists since all bodies in the cosmos have a soul). Earth enables a body to be material and sensible, as well as allowing for other elements to act upon it and move it. Water enables a body to grow, produce, nurture, and increase. Both of these elements work together as part of the low cosmos (or the Earth) in conjunction with air and fire.